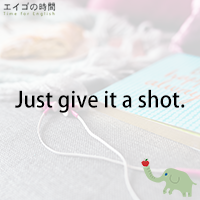 Today you’re going to learn the phrase “give it a shot”. Another example. Actually, this is a real story. I was with a friend of mine. We were playing a golf game. I don’t play golf. I’ve never played golf. So I was rather hesitant at first. Then the friend said, “Hey it’s only a game. Just give it a shot”. As you can probably imagine, the phrase “to give it a shot” means to make an attempt or make an effort to do something, especially something new. You don’t know whether you’ll like it or not, whether it’ll work or not. You just do it to find out. Now, here’s a quiz for you. I’ll give you three options. Please choose the one that uses the phrase “give it a shot” most appropriately. Ready? 1. when he saw his friend waiting for a train. 2. when he saw his friend being admitted to hospital for food poisoning. 3. when he saw his friend riding on a Segway. Next Post 勘違い – You must be mistaken.